Sometimes unplanned adoptions are the most fun. 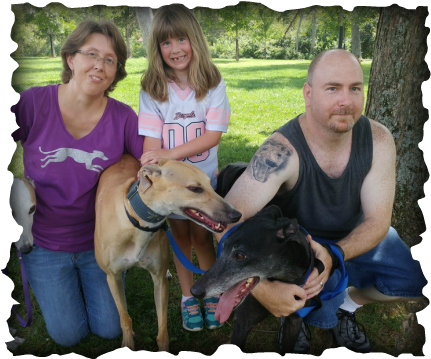 Amy, Jason and Kaitlyn of Englewood came to our fall family picnic at Keehner Park, met Shady Shaelee, and decided they weren't going home without her. Now called Shayla, this beautiful black female joins white female Sasha and red male Topper (whose image was nicely recreated in the tattoo on Jason's arm). The two girls are already good buddies, and we're hoping a mature female greyhound in the family will tone down Topper's enthusiasm a bit. Congratulations!